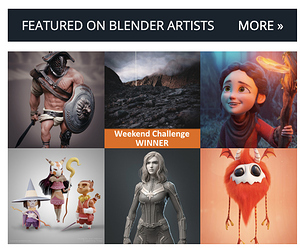 Speaking of that, why isn’t there a link to Blendernation featured in a prominent spot on BA’s front page? I mean it’s the major news site for Blender users, and this is the major community site, and both are run by the same person. And exactly that is one (among other ) reasons why I respect @bartv and other people who treat things like this. Their ability to keep things separate. Perhaps the time has come for a subtle link back to BlenderNation from here too. I don’t have too many options to add something very visual, what comes to mind is just a small ‘Blender News’ link at the top of the page? Alternatively I could add something to the ‘Friends of Blender Artists’, but the news would appear only part of the time which might be a little hard/odd. that is one (among other ) reasons why I respect @bartv and other people who treat things like this. Thank you! I like to think of it more from a perspective of ‘what is useful for the Blender community’. I’ve been hanging on Instagram more this week and was surprised by the amount of new Blender users who still hadn’t heard of Blender Artists and BlenderNation. So there’s still work to be done! I don’t have much insight to all of this social media stuff. BA is pretty much the only site I am communicating through but I can imagine that this ‘old timy’ forum might not be the first thing a younger generation will discover. 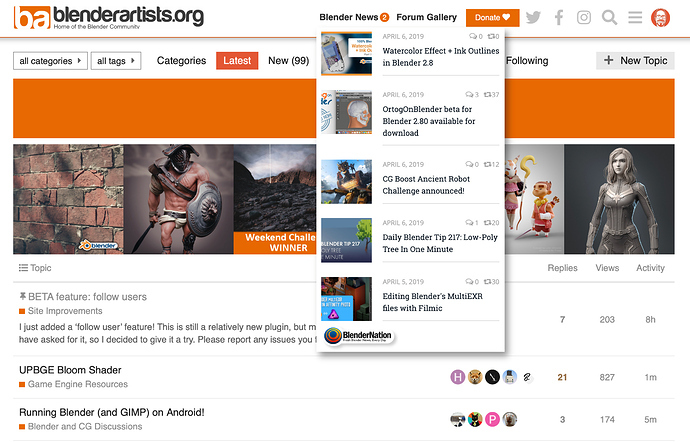 That said, how do you think about a curated link list as guidance to the Blender ecosystem. A pinned post, maybe in the support section? The “Orange Pages of the Blenderverse”, a place where we can link new folks to when they are out for the ride that Blender is. Edit: Wait… Second thought. That wouldn’t show up as nice/ prominent on mobile devices, which I believe are vastly spread for browsing BA. Mobile is definitely something to be considered but it’s still ‘only’ 10% of the total traffic, so I think it’s ok to push that to ‘V2’ for now. Oh, ok. Nice to hear that most Blenderusers are still using real computers like proper human do. But then again it’s not that surprising at all. P.S. : To avoid cracking our raw egg friends. I said proper human with a friendly, humoures smile.